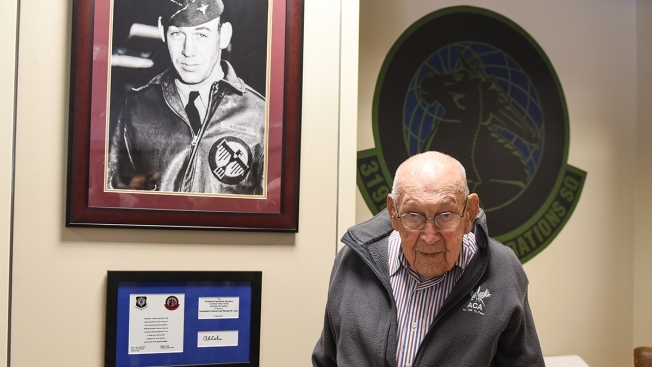 Retired Lt. Col. Richard E. Cole stands with a portrait of himself from his time in the Army Air Corps during World War II at the 319th Special Operations Squadron, Hurlburt Field Fla., April 7, 2017. In early 1942, Cole volunteered for Special Mission Number 1, which trained at Eglin Air Field, and on April 18, 1942, he served as then-Lt. Col. James H. Doolittle’s co-pilot during the Raid on Tokyo. The Doolittle Raid boosted morale on the U.S. homefront after the attack on Pearl Harbor. Members of the squadron left Alameda, California on April 2, 1942, and two days later they were told they would strike Tokyo. Robert Whetstone, a spokesman for Brooke Army Medical Center in San Antonio, confirmed Cole's death. Whetstone had no immediate additional details.